You are currently browsing articles tagged Steve Wozniak. Steve Wozniak’s views have evolved quickly in regards to the existential threat of intelligent machines. In early 2015, he told the Australian Financial Review that “computers are going to take over from humans, no question.” The future is “very bad for people,” he warned. Just a few months later, Homo sapiens received an upgrade from the Apple co-founder, who said AI would keep us around as “family pets,” even if they were making all the crucial decisions. Well, that’s a relief. In the same week, I successfully filed my taxes and found out my species wasn’t doomed. Nice. The Woz granted an interview to USA Today in advance of this weekend’s Silicon Valley Comic Con, with it’s forward-thinking theme: “The Future of Humanity: Where Will We Be in 2075?” In that year, the computer programmer believes Apple, Facebook and Google and will be even bigger and more formidable corporations and cities will sprout up in heretofore uninhabitable deserts. Neither seems plausible. — The influence of artificial intelligence. Within all cities, AI will be ubiquitous, Wozniak says. Like a scene straight from the movie Minority Report, consumers will interact with smart walls and other surfaces to shop, communicate and be entertained. Medical devices will enable self-diagnosis and doctor-free prescriptions, he says. “The question will be ethical, on whether we can eliminate the need for physicians,” he says. Steve Wozniak just completed one of his wide-ranging AMAs at Reddit, providing thoughtful commentary on myriad subjects. On the state of the company he cofounded, he admires Tim Cook’s management though he has misgivings about the Apple Watch (and who doesn’t!). The Woz longs for the day when we can talk to machines that know us as well as–even better than–our human friends, which will be wonderful and creepy. In the Apple/FBI scrum, he comes down on the side civil liberties, which is unsurprising if you know his history. A few exchanges follow. What is Tim Cook doing right/wrong, in your opinion? Tim Cook is acknowledging the employees of Apple and the customers of Apple as real people. He is continuing a strong tradition that Steve Jobs was known for of making good products that help people do things they want to do in their life, and not taking the company into roads of, “Oh, we’ll make all our money like by knowing you and advertising to you.” We’ll make good products. And you know, I started out as a hardware product guy, so I’m glad to see that. Everything else, I’m very approving of Tim Cook, because every time we have a new iOS update, I’m very happy that it’s doing things that really affect people. Like transferring calls from my phone to my computer, etc. I really love even the Airplay, and all that. So, I love the software, and I love the hardware, and nothing’s letting me down. So I approve very strongly of Tim Cook and the new Apple. I dearly miss Steve Jobs too, but, that’s all. What is your opinion on how immersive our technology is becoming? We use computers in some form, almost constantly. Do you ever feel in your own life you that it becomes overwhelming? I have that feeling all the time because I like a nice, quiet, simple life. I grew up shy. I’m more into products than I’m into socializing. And I do not carry around my phone answering every text message instantly. I am not one of those people. I wait until I’m alone in my places and get on my computer and do things where I think I’m more efficient. I really see a lot of people that are dragged into it, but you know, I don’t criticize them. When you have change, it’s not that the change in how people are behaving different to you is bad or good, it’s just different. So that’s sort of the modern way, and you know the millennials, every generation wants to criticize the next generation for missing out on things like personal human contact, but I’ll tell you a little story. When we started Apple, Steve Jobs and I talked about how we wanted to make blind people as equal and capable as sighted people, and you’d have to say we succeeded when you look at all the people walking down the sidewalk looking down at something in their hands and totally oblivious to everything around them! What is your favorite up and coming gadget? Anything people don’t know about yet? Well, I would think probably one of them is certainly the Oculus Rift, or any of the VR headsets. I love putting mine on and watching a basketball game live; it was just an experience that you can’t believe. Sometimes I come out of a VR world, take off the helmet, and I can’t believe I’m actually sitting in my office, at a desk at home. So, that’s one of the big ones. Right now, Amazon Echo; it’s getting so popular among the people that use it and they speak so highly of it, and it’s so inexpensive. I see a lot of developers that went into smartphones jumping onto that. It’s a platform, and when you have a platform that everybody else is writing apps for and connecting to, basically they’re advertising your company as much as you are. Obviously, I’m very interested in the evolution of self-driving cars. Right now, the assist that they give you for keeping in your lane and cruise control…the cruise control started back in 2004 actually, adjusting your distance. I love driving my Tesla so much, I just smile! I sit there in the driver’s seat, and I kinda look over at my wife, and I just smile. I’m so happy, not using my hands or feet. So, I think the progression towards self-driving cars is going to be a good one. But it falls into that category of AI. Now, the AI that impresses me, I fell in love 10 years ago – well not 10 years ago, but whenever it started; Siri was an app you could buy for the iPhone, and I bought it. And for one year, Apple didn’t have it. I just spoke of it as the app that changed my life, because I get to live as a human, saying things out of my head the way I would to another human, and a machine understands me. And I have wanted that to be the future for…forever. I think Steve Wozniak is great because how can you not, but I am willing to wager there will still be some humans driving cars in 20 years, though the Woz predicted there won’t be in his keynote speech at the Gartner Symposium. Hyperbole aside, he is right that driverless is gaining speed, even if the ETA is MIA. The Apple co-founder also gave voice to his concerns about surveillance enabled by technologies, though he acknowledges that war has likely been lost. Two excerpts about the address from Divina Paredes at Computerworld. Well, of course we shouldn’t engage in autonomous warfare, but what’s obvious now might not always seem so clear. What’s perfectly sensible today might seem painfully naive tomorrow. I think humans create tools to use them, eventually. When electricity (or some other power source) is coursing through those objects, the tools almost become demanding of our attention. If you had asked the typical person 50 years ago–20 years ago?–whether they would be accepting of a surveillance state, the answer would have been a resounding “no.” But here we are. It just creeped up on us. How creepy. I still, however, am glad that Stephen Hawking, Steve Wozniak, Elon Musk and a thousand others engaged in science and technology have petitioned for a ban on AI warfare. It can’t hurt. After previously stating that a robotic future powered by artificial intelligence (AI) would be “scary and very bad for people” and that robots would “get rid of the slow humans,” Wozniak has staged a U-turn and says he now thinks robots taking over would be good for the human race. Goods and food made, served and delivered by humans will some day (and soon) be an artisanal and specialized field, the same way some still buy handmade shoes at a great expense, but most of us hop around on the machine-manufactured kind. That’s right, the wealthy will say, an actual lady’s hands touched my carrots! How smart! He imagined a world in which these kinds of devices would be able to teach our children for us. Rather than just putting more gadgets and gizmos in the classroom, he said, each classroom needs to have fewer students, and kids who are further ahead than their peers should be nurtured, not forced to fall in line. Dismissing the concern over giving artificial intelligence too much intelligence, he said that’s already happened. Steve Wozniak, who recently damned Tesla cars with faint praise, selling the Datsun 280-ZX in 1979. Steve Wozniak made some buzzed-about, revisionist comments about Apple at the “Go Further with Ford” conference last week, which no doubt contained a lot of truth, though as an outsider I can’t agree with it all. He pointed out Jobs’ flaws as a leader in his first go-around at the company and gave more credit to the vilified John Sculley and the forgotten Gil Amelio (who hired ace designer Jonathan Ive). All that’s good. But I think his diminution of the MacIntosh isn’t particularly fair on some levels. I understand it wasn’t an immediate commercial success nor a perfect machine, but it was, more than any other, the computer that made the general public embrace the coming Digital Age and forget the horrors of working on Honeywells and the like. It showed what was possible even if it didn’t realize all the potential itself. So give me thoughts on the Model S…specifically, I’m wondering about your thoughts on the center console. Yes. To me, you know, it’s not horrible. If you take it into account, you can use it. I’m good for it. But for most people, I have so much trouble in a car, driving with touchscreens, that I worry about people trying to access the screen while they’re driving. I worry about that a lot, and I don’t think it’s that attractive. It’s not unattractive — not totally ugly at least — but the controls in the Mercedes are so ergonomic, they fit your hand, you never have to look at them, you can feel where your hand is. So I do have a reservation about that, but not enough to turn me off. I think it’s a great car, I think it’s the first electric car that was worth anything. I look at it as, all the electric cars so far have been very tiny so they get better mileage on smaller batteries, you know, they can go 30 miles… or they were sports cars. Well, this is the first one, it’s a luxury car, a big sedan that fits five people comfortably. Well, my gosh, those are the people that are going out and buying $100,000 Mercedes already, so a $100,000 car… money doesn’t matter. The fact that $40,000 is batteries, they don’t see it as much. So I think they found the right market niche that might be permanent, might be enough to keep a company sustained. And the next step is to bring it to a lower-priced market. And the idea of the replaceable batteries means you buy your battery per mile. You lease the battery, you don’t own it. You only buy the car. That’s a step that’ll appease the other crowd. Luxury guys, I think, really want to own their own battery and don’t even want to swap it with somebody else’s — they want to know what they got. But it is a problem because you do have to pay now for the battery, and you have to pay for the electricity. As opposed to, you know, just gasoline. So it’s going to probably be more expensive per mile that way, and the economic factor might come into play. But that makes me think, you know, just driving into this building, we passed Ford’s fuel cell research division and I thought, oh my gosh! The words we heard last night from [Ford CEO Alan Mulally] … he mentioned fuel cells, he mentioned electric vehicles. Well, those two go together perfectly. You have to lose energy if you know physics, but it transfers so efficiently to the wheels, that’s why it can still make sense economically. And then you don’t have to carry this huge weight of batteries and the huge cost of the batteries. There are different problems with that one, though. Just how close were you to Steve after his brief involvement with Atari? We’d talk on the phone infrequently, but he’d come up to [my house in] Woodside about once a month, usually on a Saturday or Sunday morning, and we’d go up on the hill and talk. Occasionally, I’d go down to his place, but a lot of the time it was him coming up to my place. Steve took a failing computer company — and they probably would have never brought him back if they weren’t at the end of their rope — and turned it into the highest-market-cap company in the world. People were always aware that innovative solutions are good for your company. I think this just underscored it in a really powerful way. It wasn’t just through cutting costs or innovative marketing. Though Steve was a pretty good marketer. But that was when he returned to Apple in 1997. Most of the time when people talk about the ‘next Steve Jobs,’ they’re using that phrase to refer to entrepreneurs who are still early on in their careers. So, are those people really that hard up for work? Phone phreak turned Apple genius Steve Wozniak visits Merv Griffin in 1984. Woz, what changes would you recommend to fix the K-12 education system in the U.S.? Computers offered a real change in the tools of the classroom, but they don’t seem to have changed much. The learning is the same, only done via computers, for the most part. I had hoped for more. I do want to feel a part of the big improvement someday, so I hope that there is some further step with computers. That would be when a computer becomes conscious and caring and becomes the best friend that each student wants to be with. It will look at their faces and speak the way that particular student likes and be a good friend more than a teacher. One thing that has not changed over time in education is that we all, in a class, get the same material presentation together. The same pages as everyone else on Monday, the same pages on Tuesday, etc. Individuals as we are, we have different lapses along the way. A teacher could back up and explain something to fill in a gap, but each of the 30 students has different ‘gaps.’ The solution will be the equivalent of one teacher per student. This opens the door to a student choosing to get only straight A’s, and only studying subjects they want to. And there will be more room to teach thinking and creativity and not all the same answer, which is not even their own answer, but out of a book. It’s a brave step, but right. “Ever the engineering scientist, he offered his view that within as few as 40 years computing technology will be so advanced that computers will nearly be sentient beings capable of personality. ‘The war against the machines was a long, long time ago,’ he said. Mankind didn’t set out deliberately to create a brain, Wozniak said. But by first building computers, and then linking them through Arpanet, the forerunner of the Internet, and then creating search engines to handle the mass of information now available, the world ended up with a brain. “How did you and Steve come up with the idea for the first Apple product, the Apple I? Oh, a lot of people saw the Apple I before Steve Jobs even knew about it. I was in the Homebrew Computer Club. Steve was up in Oregon, working at an orchard, in a commune. We were really not in touch. But I got inspired to help this revolution. People in our club thought the personal computer would affect everyone’s life. We thought everyone would have a little computer, a little thing with switches and weird numbers on it, and people would learn to program to operate a computer. We didn’t think it would be normal stuff like it turned out to be. I never wanted to run a business. I had a perfect job for life at HP. I went to club meetings every week and I passed out my schematics for the Apple I, no copyright, nothing, just, “Hey all you guys here is a cheap way to build a computer.” I would demo it on a TV set. Then Steve Jobs came in from Oregon, and he saw what the club was about, and he saw the interest in my design. I had the only one that was really affordable. Our first idea was just to make printed circuit boards. We could make them for 20 dollars and sell them for 40 or something like that. I had given the schematics away. But Steve thought it could be a company. This was actually our fifth product together. We always were 50-50 partners. We were best friends. We first did the blue boxes. The next one I did was I saw Pong at a bowling alley so I built my own Pong with 28 chips. I was at HP designing calculators. Steve saw Pong and ran down to Atari and showed it to them and they hired him. Whether they thought he had participated in the design, I don’t know and I could not care less. They offered him a job and put him on the night shift. They said he doesn’t get along with people very well, he’s very independent minded. It rubbed against people. So they put him on the night shift alone. Our next project was when Steve said that Nolan (Bushnell, head of Atari) wanted a one-player game with bricks that you hit out. He said we could get a lot of money if we could design it with very few chips. So we built that one and got paid by Atari. The legend is that Steve cheated you out of some money on that deal. Science/Tech: Apple Co-Founder Ronald Wayne Could Have Made $22 Billion. Instead He Plays Penny Slots With His Social Security Check. It’s tough to say how Apple Computers co-founder Ronald Wayne would have spent $22 billion dollars, and we’ll never know for sure. Wayne was the minority partner to Steve Jobs and Steve Wozniak at the formation of Apple in 1976, and his ten-percent stake would be worth an insane fortune if he had held on to it. But Wayne, who had previously suffered through painful business failures, had misgivings about the wildly talented Jobs and Woz, so he sold his stake back to them after just 12 days. “It’s usually past midnight when Ron Wayne, co-founder of Apple–colossus of the tech world, and Silicon Valley’s most adored franchise–leaves his home here and heads into town. Averting his eyes from a boneyard of abandoned mobile homes, he drives past Terrible’s Lakeside Casino & RV Park, then makes a left at the massage parlor built in the shape of a castle. 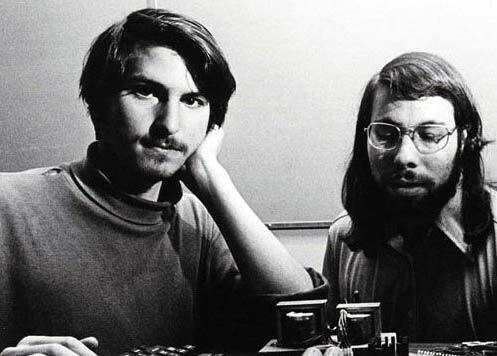 He was present at the birth of cool on April Fool’s Day, 1976: Co-founder—along with Steve Jobs and Steve Wozniak—of the Apple Computer Inc., Wayne designed the company’s original logo, wrote the manual for the Apple I computer, and drafted the fledgling company’s partnership agreement.